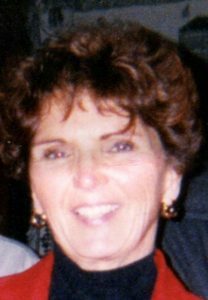 SOUTHBURY — Patricia D. Beane, 80, of Southbury, formerly of Oxford, the beloved wife of the late M. Joseph Beane, entered into eternal rest peacefully on Thursday, Sept. 6, 2018 at Watermark Senior Living, surrounded by her loving family. She was born in Bridgeport on Oct. 19, 1937, the loving daughter of the late Paul and Dorothy (Puffer) DeBarnardo. Patricia was a devout communicant of St. Thomas the Apostle Church in Oxford. In her spare time, Patricia could be found gardening, knitting or sewing. She enjoyed traveling to Europe and the islands. Patricia will be sadly missed by her family and many friends, but she will remain forever in their hearts. Patricia’s loving family, includes her two devoted daughters, Kim McManus of Bethlehem and Joanne Beane of Naugatuck; her three loving grandchildren, Dawn Beane, Conor McManus and Trevor McManus, and her cherished great-grandson, Jacob. A graveside service will be held on Tuesday, Sept. 18, 2018 at 3:30 p.m. in the family plot at Southford Cemetery, Oxford, with Reverend Thomas Shepard, officiating. There will be no calling hours. The Miller-Ward Funeral Home, 260 Bank St., Seymour, is caring for the family. Memorial gifts in memory of Patricia can be made to St. Thomas the Apostle Church through the funeral home. To leave online condolences or to light a virtual candle, visit www.millerwardfuneralhome.com.